First there was Brexit, then Donald Trump. Will Italy deliver the next shock to the political establishment? Italians will vote Sunday in a crucial referendum that could -- in one nightmare scenario -- force the prime minister's resignation, spark a banking crisis and ultimately push Italy out of the eurozone. Such a scenario would require a line of political dominoes to fall in just the right way. But investors are increasingly concerned. The yield on 10-year Italian government bonds has spiked in recent weeks above 2%. The yield on German debt is just 0.3%. The surge in borrowing costs, combined with punishment doled out to Italian banking stocks, suggest that investors now view the country as the eurozone's biggest risk, and the latest in a long line of threats to the region's stability. Italians are being asked to vote on a sweeping series of constitutional reforms championed by Prime Minister Matteo Renzi. He says the changes are vital to end political gridlock and revive Italy's stagnant economy, and has pledged to resign if voters reject them. The immediate risk stems from the country's troubled banks, which are saddled with about €360 billion ($383 billion) in non-performing loans, roughly a third of the eurozone total. 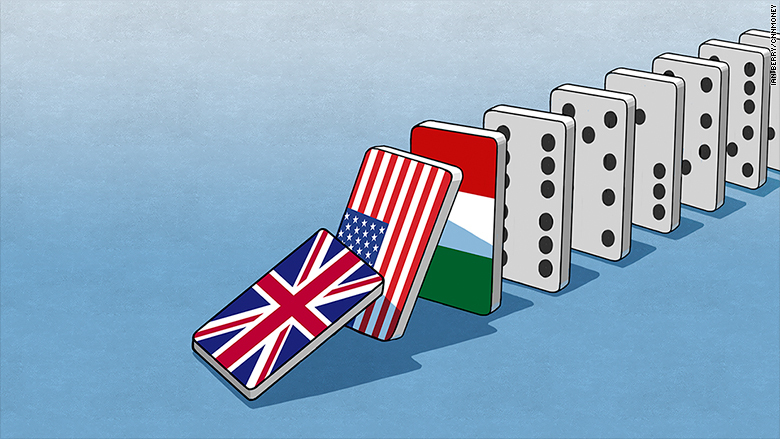 The sector is already in distress, but the prospect of a political crisis, market turmoil and recession would make matters worse. "Many plausible scenarios point to a narrowing of options for the banks in distress, and broadly bad news should 'no' prevail -- but the question is, how bad?" asked Luca Raffellini of Frost & Sullivan. Monte dei Paschi (BMDPF) -- the world's oldest operating bank -- is likely to serve as the proverbial canary in the coal mine. The bank is racing to raise new funds, and its plan could be upended by a sudden change in government. Its stock has lost 86% so far this year, and other heavyweights such as Unicredit (UNCFF) have fared little better. 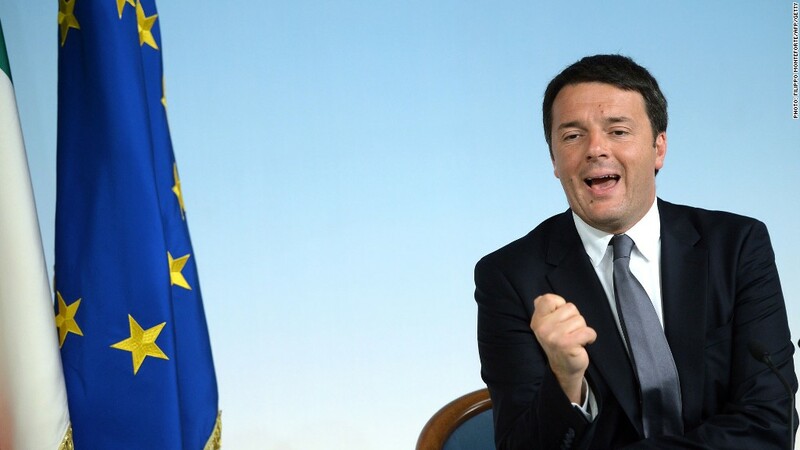 Matteo Renzi's political future will be decided on Sunday. Here's where the politics gets really tricky to predict: If Renzi follows through on his pledge to resign, it is possible -- but not a foregone conclusion -- that early elections could be triggered. Italy has several eurosceptic opposition parties, including the Five-Star Movement (on the left) and the Northern League (on the right). It does not, however, have a viable centrist alternative to the current government. "A political crisis could thus open up a bigger can of worms in Italy than it would elsewhere," said economists at Berenberg. If early elections are called, the Five-Star Movement could campaign on a promise to hold a referendum on Italy's continued membership in the euro. The party, founded by comedian Beppe Grillo, is animated by many of the same forces that Trump leveraged to win the White House. Nearly 40% of Italians have an unfavorable view of the EU, according to a Pew Research Center poll from June. Berenberg's analysts believe the probability of Italy actually holding a referendum on the euro is less than 5%. There are important reasons for this: A referendum may not even be legal under the Italian constitution, and there's no guarantee that eurosceptic parties would triumph in early elections. Analysts broadly agree that Italy is most likely to stick with the euro. "In the end, the risk that Italy would want to leave the safety of the euro looks rather remote," wrote Holger Schmieding, chief economist at Berenberg Bank. But even the most airtight assurance might be of little comfort to investors in a post-Brexit, post-Trump world.